NRL player Jack de Belin charged over an alleged sexual assault. NRL player Jack de Belin has been charged over an alleged sexual assault. The 27-year-old St George Illawarra Dragon forward voluntarily attended the station on Thursday afternoon after the alleged incident with a 19-year-old woman at a Wollongong unit on the weekend. De Belin has been charged with one count of aggravated sexual assault in company and has been granted conditional bail to appear at Wollongong Local Court on February 12. The NRL said the integrity unit has been advised and the league will allow the “legal process” to take its course. The incident allegedly happened in the early hours of Sunday morning during a night out after the woman left a Wollongong establishment with a large group including de Belin, the Nine Network reported. She reportedly hopped into a taxi with de Belin and a lower grade player and was under the impression they were headed to another club, but instead ended up at the apartment, Nine said. 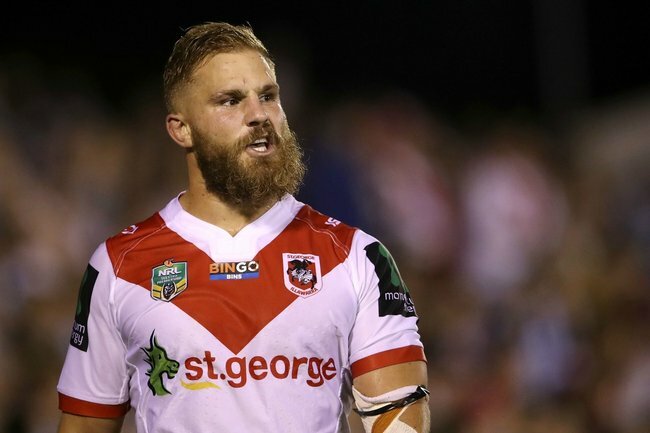 The St George Illawarra Dragons have made the following statement regarding Jack de Belin. The 19-year-old reportedly went to the bathroom, and when she came out she said the players were naked and sexually assaulted her. The St George Illawarra Dragons said in a statement the club is taking the matter “very seriously”. “Jack has been provided with welfare support to enable him the time and opportunity to deal with the matter,” the club said in a statement on Thursday. Meanwhile, Walker, 24, was charged with common assault and assault occasioning actual bodily harm – both domestic violence-related – after his partner suffered cuts to her shoulder, leg and feet in Dee Why on December 6.